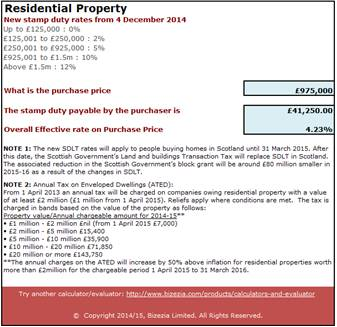 On 3 December 2014, The Chancellor of the Exchequer in his Autumn Statement announced new stamp duty rates from 4 December 2014 payable by the purchaser of residential property. Thanks to Bizeza, Accountants, Lawyers and Estate Agents can now provide a FREE stamp duty calculator to their clients. Don’t confuse this calculator with the one that you can see and use on the HMRC website. The above calculator enables you to insert your firm’s name and web address so that when it sits on your website, it’s a handy tool from your firm. Needless to say, the HMRC calculator is not available to sit on your website at all. © Copyright 2014/15, Bizezia Limited. All Rights Reserved.